Customizing animations is made possible with Cinema4D. You can control character details, lighting fields, processing volume and polygon reduction tools, management shadows, and transparencies. Since this software has been designed for the production of films for television, advertising, science, architecture, and other fields, Cinema4D provides you with professional looking results. This applies to packaging, architecture, and 3D modeling. 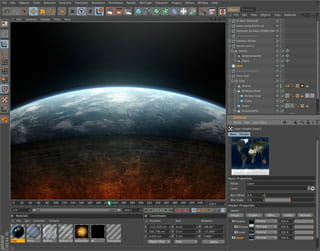 Cinema4D supports the following formats: 3D Studio, BVH Biovision / BVA, DEM, DXF, Direct 3D, FBX, Lightwave, Monzoom, Quickdraw 3D, STL, Shockwave 3D, UZR, VMRL, Wavefront OBJ, TIFF, BodyPaint 3D Targa TGA, BMP, PICT, IFF, JPEG, RLA, RPF, SGI, PNG, JP2, QuickTime, AVI, After Effects, and Final Cut. This is a demo version only. Some features are restricted. Modules must be purchased separately. Latest update on October 24, 2018 at 05:20 AM.